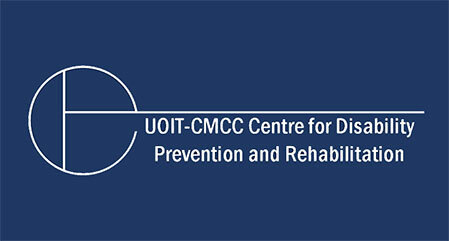 For every dollar of base funding, UOIT generates $3.60 of spending impacts across Ontario. 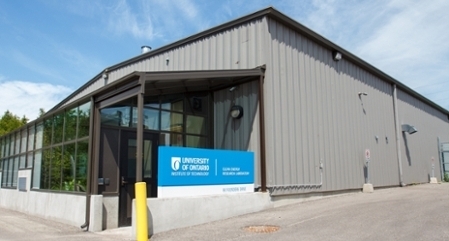 In 2014-2015, the university’s spending contributed almost $205 million to Ontario’s GDP. 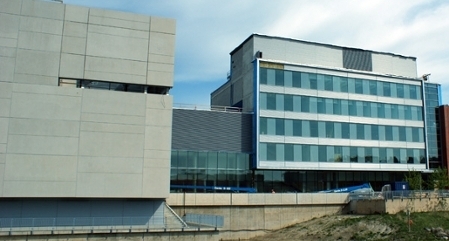 In the same period, the university generated and supported 1,949 jobs across the province. More than two thirds of these jobs are in Durham Region and Northumberland County. All surrounding areas benefit from the university's activities. The economic impact is widely distributed across the constituent municipalities and townships. 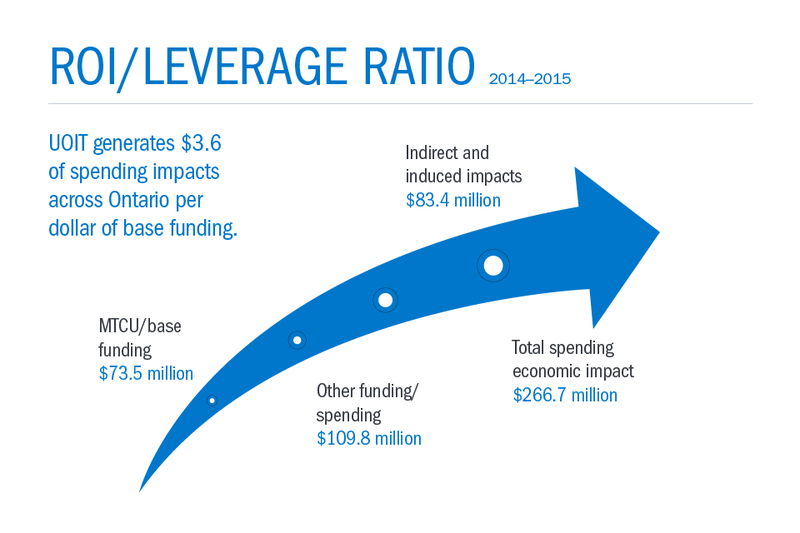 UOIT generates $3.60 of spending impacts across Ontario per dollar of base funding. Governments – federal, provincial, regional and municipal – need universities. That’s because universities enhance competition in the global marketplace, and help local businesses innovate and stay productive. We diversify local economies helping communities thrive during economic changes and are hubs for innovation. Businesses and community organizations need universities. That’s because we educate your future workforce and upskill your existing one increasing productivity. We are a large purchaser of goods and services. We are anchors within our communities. Communities want universities. That’s because we are sources of high paying jobs and attract students and visitors. We add to the social and cultural fabric of the communities in which we reside. 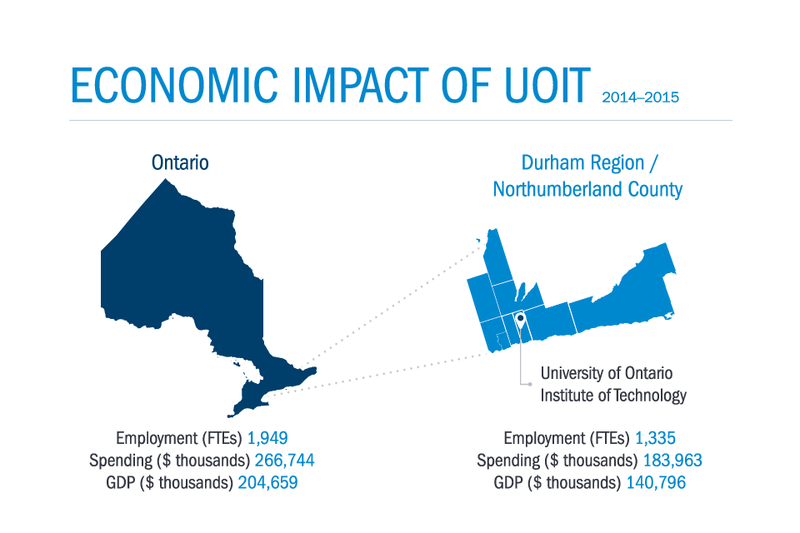 In 2014-2015 alone, spending undertaken by UOIT is estimated to have contributed $204.7 million to Ontario’s economy in GDP and generated and supported 1,949 jobs across the province. Our impact extends beyond Durham – from every dollar of base funding, we generate $3.60 of spending impacts across Ontario. To learn more about the university's contribution to our economy access the full report below.